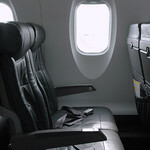 For those of you who travel regularly by plane, you will know the “joy” of being strapped into your allocated seat for a few hours. You have the smallest possible personal space, and those sitting next to you can be riveting company and fun to be with, or exceptionally dull – unfortunately the later being most common! This got me thinking…how could we make this journey of travel more interesting and utilize the many creative skills of the passengers who are getting a tad bored? One possible solution is to invite passengers to participate in an anonymous “chatter” group discussion on a selected brainstorming topic during the flight. To be included, they would press a special “call button” which adds their seat number into the discussion. A Flight Attendant then provides them with an electronic writing tablet that allows communication with the other interested passengers. At the conclusion of the flight, those involved could elect to have a copy of the transcript E-mailed to them, just in case there were any creative gems of inspiration written! To me, this would be a much better use of people’s travel time and would make the total plane experience much more interesting and potentially productive. Thanks Christy for the feedback….yes, I know what you mean. There might need to be a number filter on a particular seat to ensure that all participants get a fair go! There are airlines that have inbuilt tvs/tablets that get passed out, and you can link with passengers in other seats to play games against one another… potential for sending messages too??? Although that could open a can of worms…. Thanks, great feedback…..yes, best to have anonymous worms in the can otherwise it could get a tad interesting!